5 October 2010, at 9:43a.m. 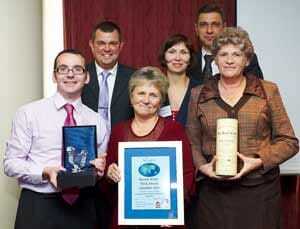 UK - Aviagen has held their first ever broiler flock awards in Russia at their recent Moscow seminar. Although the company has always recognised Parent Stock (PS) success, it is the first time that specific awards have been given out for broiler performance. Categories included: best individual broiler flock, best individual parent stock flock, continuously improved broiler flock and best yearly performance for PS flocks. Winners came from across Russia and very much read like a Who's Who of the industry. Vasilieveskaya, part of the Cherkizovo group, Russia's largest poultry producer, scooped the inaugural best broiler flock award. OGO Holdings took the continuous improvement award and Elinar best yearly PS performance. Nekrasovo won the best parent stock flock award. Jonny Harrison, Regional Technical Manager, said: "Russia is a very testing market for poultry and success requires a tremendous effort on behalf of producers. This year we have seen an incredibly hot summer and over the twelve months temperatures can go from minus 40 degrees to plus 40 degrees Centigrade which places huge demands on farm managers. "For that reason, we wanted to recognise the success of our broiler producers who have shown once again that the Ross broiler is one of the most adaptable birds there is, succeeding in different environments around the world. "Vasilieveskaya in particular has achieved excellent results with a European Efficiency Factor of 349 which compares very well with companies in more temperate climates. Nekrasovo also achieved 135 chicks per hen housed, which is a fantastic result in anyone's book." The team were also quick to thank all attendees for continuing to help with research and development by providing flock information to Aviagen technical staff. Mr Harrison added: "When we started the information gathering process, we had to explain the process very thoroughly and let people know that there would be long term benefits in terms of our own research and development. That message has certainly got through as more often than not people now come to us with information and the flock awards are another way to recognise and thank our customers. "This year has underlined more than ever the importance of having a team on the ground that really understands customer needs and are there to provide support every step of the way and we wouldn't be able to do that without the help of our customers."